Frontières is the premier name in international co-production project markets for genre films around the world. With events in Cannes, Amsterdam, and the flagship operation at Montreal's Fantasia, Frontières has become the place to be to pitch new projects in the hopes of gaining support from the ever growing community of co-production entities, sales agents, and distributors who looks to the market to see what's next in the world of fantastic cinema. In case you're unaware of how these market events work, as I was for a long time, here is a basic rundown. A project market, like Frontières, is a place for ideas to find the support they need to become finished products. Filmmakers - most often writers, directors, and producers - submit their projects to the market organizers, in the hope that their ideas are strong enough to convince the market to give them a larger platform on which to pitch their story to people who have the means to help them make it a reality. The projects at Frontières are at various stages of pro-production. Most have at least a first version of a script and a director and/or producer attached. Some go a step further and have talent, actors/actresses, attached or at least are in the process of negotiating. Some projects have created what are called "mood reels", which are either original visuals shot to impress upon investors the mood the filmmakers hope to evoke, or visuals culled from other films that the projects see as comparable to their own vision. 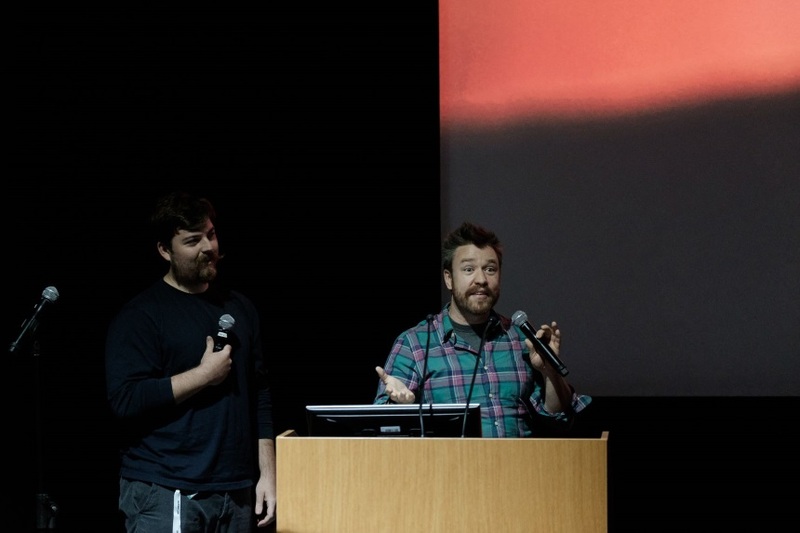 A few of the projects even have some, or perhaps even all of the funding they seek in place but are lookign for help in making the film viable to outside markets by attaching a sales company or overseas distributor. There is really a wide range of preparation levels at Frontières, but in the end, they all want one thing: to make their movie. The most exciting pitch of the day, for me and several of my Screen Anarchy colleagues, was definitely Nyla Innuksuk's Slash/Back. Written and to be directed by Innuksuk, Slash/Back is the story of a group of four indigenous teen girls battling aliens in their far north homeland. Innuksuk's vision is clear, and the prospect of giving voice to a woefully underrepresented population of indigenous peoples is very enticing. Not only is Slash/Back a story of strength from a group not normally given that kind of representation on screen, it sounds like a fascinating coming-of-age story in a world that is foreign to most outside eyes. A native of Nunavut, the farthest northern region of Canada, Innuksuk's memories of a childhood filled adventures like The Goonies and E.T., never had a story to which she could truly relate. The idea of putting Nunavut girls on screen as badass heroes who save their home from aliens intent on destruction is an incredibly starting poit for a new vision. Slash/Back was presented with some test footage of girls from the region just playing around, living their lives on what often looks like alien terrain. This unique landscape, coupled with a story that evokes the same tone as Attack the Block, could be a breath of fresh air in the genre world. Another project that looks to turn familiar ideas on their heads is Roberto San Sebastián's Bedtime. Described as a mix of Die Hard and Home Alone, this new project from the director of genre festival hit Night of the Virgin, could be a very fun adventure if given the right support. The way it was discussed by San Sebastián and his producers, Bedtime would be a violent, horrific, and comedic take on the Home Alone premise. The film starts out as a comedy, but soon the tables turn and things get very bloody, very quickly. The story centers around a young boy with delusions of evil in his home. While his parents disblieve him, he is soon proven right as people he trusts turn out to be less friendly than he once thought. 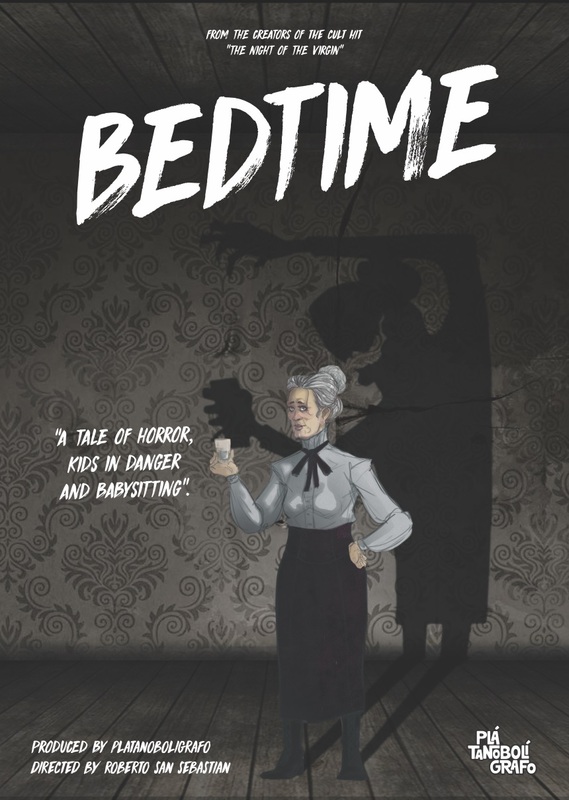 About as far from the coming-of-age seriousness of Slash/Back as one could get, Bedtime looks to capitalize more on the instiable appetite for bloody, fast paced horror that fuels the genre film festival and direct-to-video markets. With a notably successful hit in Night of the Virgin, which sold to numerous territories around the world after its impressive festival run, San Sebastián has a great idea and a solid track record that is sure to have investors and sales agents at least interested in supporting his latest project. Finnish director Hanne Bergholm's project, Birds of a Feather, takes the coming-of-age story and the gross-out horror and mixes them together in what could potentially be a break out hit for this young filmmaker and her producer, Mika Ritalahti of Silva Mysterium. A young girl lives in her mother's shadow, pressured to succeed in the world in which her mother failed. The girl never quite feels like herself, until one day when she finds an egg in the nearby forest and brings it home in the hopes that she can nurture and raise the chick within. 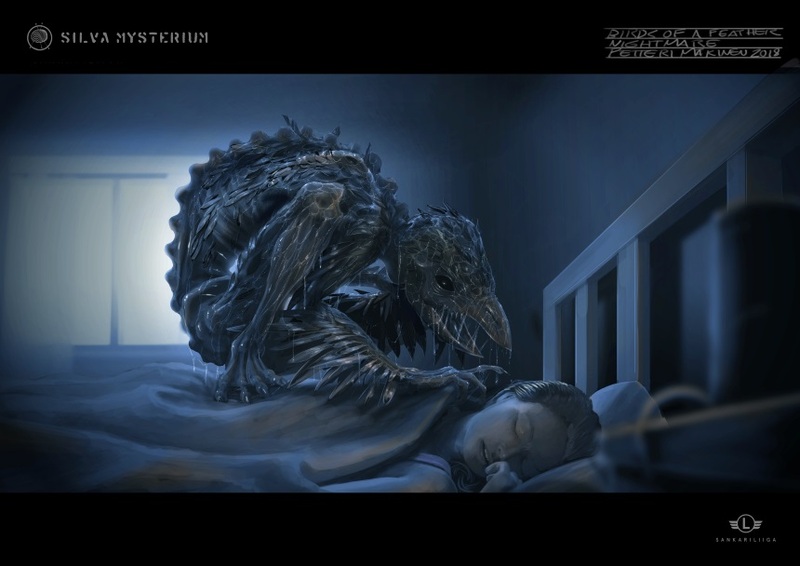 The baby bird, however, turns into something the girl never expected, and as her frustrations with her mother grow stronger, so grows the beast she helped birth into the world. Bergholm's tale of a young girl finding herself while nurturing a demanding child has tons of potential as an arthouse horror success. The film promises to mix serious emotional stakes with unpleasant but not exploitative visuals to create a film that feels tonally in the same ballpark as something like Raw or even current festival fave, Blue My Mind. The pitch was very impressive, and the concept art by Petteri Mäkinen - a piece of which we're sharing here - was just the kind of thing that gets an audience interested. We all want to see this film, and upon hearing a bit more about it and the way the story plays out, I really Bird of a Feather finds the support it needs because it looks great. Speaking of gross-outs, Austin, Texas based filmmaker Jim Hickcox's Close to You had one of the gooiest pitches of the morning, and the crowd was into it. Having directed the recently released Soft Matter and worked on a number of super gross, '80s inspired horror films over the last decade, Hickcox's work is the kind of crowd pleasing stuff that has the potential to find a wide audience at festivals if done right. Close to You had one of the most unique pitches in that there was no real concept art to speak of, just an idea that is so bizarre and full of potential that it's hard to ignore. Ishy is a twenty-something woman in Austin whose life isn't exactly exciting. One day Ishy finds a man's body and decides that she'd like to try it on, literally. Hollowing out the corpse, Ishy steps into his skin and decides to moonlight as this adult man to interesting effect, but it's not all fun and games and she now has not only her own issues to deal with, but his as well. I'm not going to lie, this sounds super fun, and having seen a bit of Hickcox's really gross and slimy work from the recent past, I'm totally into seeing where he goes with this. With a bit of success on the festival circuit, a recent home video release from Wild Eye for Soft Matter, and a budget that is far less than some of the other projects in the market, Close to You is an appealing project that could find the investment it needs once they filmmakers "flesh out" the details a bit more. The fifth selection for our own spotlight comes from filmmaker Jill Gevargizian (Jill Sixx) who is looking to make her first feature after several shorts that have been quite successful on the festival circuit. The new project, Permanent Address, is the story of a woman attempting to rebound from failed ventures in both business and romance by moving out on her own to a new town. She finds an apartment in Kansas City, but quickly discovers that even though she lives by herself now, she's not really alone. Angry spirits a sharing a space with her and intent on making her life a living hell. Gevargizian has a proven track record as a short filmmaker. Her films have screened around the world including at Fantastic Fest and Fantasia, and she's known for her impeccable sense of style. She's also worked with enough people that she's able to attract some bankable talent who are willing to do the job for a price that is enticing to investors. Permanent Address has the lowest projected budget of the five films we chose to highlight by far, which means it could be much easier for producers and investors to recoup their investment, which is one of the key elements in attracting the kind of support that Frontieres has the potential to offer. Having seen a couple of Gevargizian's shorts, I'm very interested in seeing what she can do with a feature. Permanent Address, at the projected budget level they are seeking, seems like a no brainer, and I'm hoping we see this film in production in the next year.